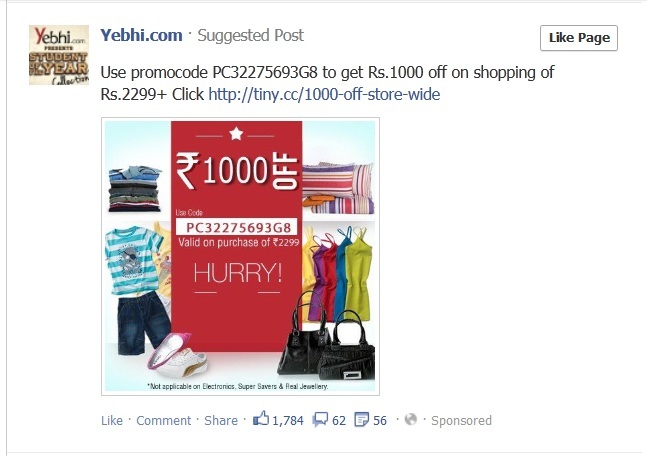 Facebook is testing a new ad type – Suggested Posts. We believe that it will take the Sponsored Stories Advertising to the next level. Visible on both Facebook desktop and mobile, Suggested Posts are posts that an advertiser pays for to make them appear in the news feed of the targeted users. Unlike Sponsored stories, which limit the visibility of the advertiser’s posts to their fans and friends of fans, Suggested Posts have a wider range, reaching out to a much larger number of users. These posts will appear even if the users have not liked the advertiser’s page with a label saying “Suggested Post” on top and “Sponsored” on the bottom. Facebook has not officially announced this feature on the network. They seem to have selected a handful of pre-launch beta advertisers to test this ad type and gauge its effectiveness. Although the mobile version does not have the “suggested post” label, it still comes under this form of advertising. Ideally, the targeting of these posts should be based on the users’ interests, demographics or geographic location, making these posts relevant for the users viewing them. If rolled out publicly, this type of Facebook advertising would enhance the reach of an advertiser, increasing the ability to influence a larger set of targeted users. While an official word from Facebook is pending, businesses/advertisers should keep their eyes and ears open for any updates on this. Or you could watch this space! I will never patronize these intrusive companies. NEVER. This is intrusive and counterproductive. I will never patronize any of these advertisers. Please take them away. I find these “suggested posts” to be utterly frustrating and very intrusive. I’m at the point where I want to give up my Facebook subscription; I cannot find a way to keep these away. We have the power to limit who actually posts to us, but not to keep away things we’re totally not interested in seeing? Stinks! A good solution is http://socialfixer.com – at least for PC’s. I think that the fact both these entities are in existence speaks volumes on how badly regarded ‘Suggested Posts’ are. These new suggested posts are majorly annoying. It’s hard enough to find my friends’ posts between the ads already. I do not go to Facebook to shop! Hi Nosheen I can officially tell you that these suggested posts are not only visible to those who have liked Facebook’s Facebook official page. I have never liked it or any of the sponsors who’s suggested adds are popping up on my wall. I have decided how ever to fight fire with fire by bagging and giving a really bad review of the sponsored site and sharing it with my friends and also letting the advertiser know what I am doing and telling them I will withdraw it if they withdraw the add. If we all responded like this it wouldn’t last long. Thanks for sharing your opinion Les. Facebook most definitely won’t continue if users are strongly against it. However, let’s see how it transpires from Beta to real time. As one who has been targeted by these tests, I assure you they are not just a little intrusive…they are massively intrusive and I hate them! I also NEVER liked FB’s official page, and as a matter of fact use the like button very rarely for commercial sites. I will NEVER patronize any business that persists with this sort of harassment. I found this post while researching “sponsored ads” because of the huge outcry this “feature” has generated among FB members. Everyone I know is furious at the intrusion into their wall space and the fact that it is a feature that cannot be turned off. “We believe that it will take the Sponsored Stories Advertising to the next level.” Yes no doubt it will. Consumers will hate it and feel even more intruded upon but marketers won’t care because companies are paying for it. The marketing industry has completely lost understanding of the concept: over exposure. I know this comment will fall on deaf ears but I felt compelled to present my thoughts anyway. Consumers rant and rave, buy pop up blockers, screen their calls, sign up to No Spam lists but your industry refuses to listen. Thanks for your comment. I agree that the sponsored ads can be a little intrusive for Facebook users but these are still in testing and their addition as a permanent facebook feature may depend on the users’ response to it. Also, these Suggested Posts may only be visible to those who have liked Facebook’s Facebook official page (still requires confirmation) and not to every one since the feature is only in the testing phase right now. We are also hopeful that Facebook will offer counter functionality as well – such as switching off the suggested posts or customizing their appearance according to the preferences of the users. Advertisers definitely need to be mindful of over-exposure as it is easier to have users dislike your business then it is to have them like it or become your fan. There are features in the advertising industry such as frequency capping using which we can control/ restrict the number of times an ad is displayed to a unique user. So it is likely that Facebook will also come up or utilize this intelligent ad display feature or something like it. The line is very fine and an intelligent advertiser must respect it.